What is RSS and what are its uses? Browsing the web, even on a semi-regular basis, you may have noticed the tiny orange boxes with ‘RSS' or a image stamped on them - usually found lurking at the edge of news articles ( like the one above). Or maybe you haven't. It's actually remarkably easy to look past these little orange boxes, when you're busy surfing - but do so at your peril. They are the key to a wealth of information and look set to make everyone's web experience a whole lot easier to digest. RSS is basically an information channel that condenses the content of a website into brief headlines, which are stored in a ‘feed'. You can then ‘subscribe' to this feed (for free) and run it through a piece of software called a reader. This enables you to read the summarised content of the site - quick, easy and completely under your control. RSS technology is used for many things. At jobs.ac.uk, we use it to display the latest jobs in certain geographical areas or employment sectors. 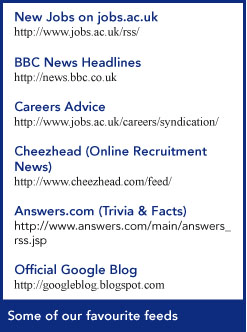 We also use them on this section ‘Career Development' for News, Articles, Top Tips or Whitepapers like this one. They're also used to display news headlines across a range of subjects and interests, show updates on blogs, display the latest business information and can even send cartoons, jokes and entertainment direct to your desktop. They can carry any kind of information from any site - but preferably from one that is updated regularly. Why is RSS so good? Because you invite the feed into your reader, rather than adding your email address to a mailing list, there's no chance of the dreaded spam. You have total control over your subscription - you can subscribe and unsubscribe at the click of a mouse. When feeds are displayed in a reader they show up as ‘headlines' - enabling you to skim read the content of numerous sites very quickly - and only choose to read articles of interest to you. RSS feeds can also be instantly updated, bringing you new information as soon as it is uploaded by the publisher. First, you need to find a feed that contains information of interest to you. A good place to start would be to keep an eye out for those little orange ‘RSS' buttons on any site that you visit regularly. This is most likely to be a site that updates regularly, like a blog, a ‘news' page or a forum or even a jobsboard! - Something you might check every day. If you fancy exploring the internet a bit more and finding some new feeds, we would recommend using a feed search engine or directory. 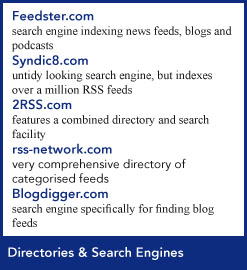 Feed search engines work in exactly the same way as a regular search engine but index only RSS feeds. A feed directory is similar, but categorises feeds, allowing you to browse them by topic, rather than searching for something specific. After you've located an interesting feed, you need to find a reader that suits you. Readers can either be an installed programme on your computer or based online. More recently, they have been added as a facility in popular web-browsers, although there features are not as good. For web-based feed reading, we recommend ‘Google Reader' (www.google.com/reader) - it's a free service, although you will have to create an account with Google. This is the case for all web-based readers. If you want to download and install a reader on your computer, we like the simplicity of Feed Reader or RSS owl, available for free download from www.feedreader.com. Like any other installed programmes, this will live on your computer's hard-drive. Most desktop readers run automatically at start-up and remain minimised/hidden, notifying you of updates when they arrive, just like most email programmes. In terms of web-browsers, Mozilla Firefox currently features the ‘Live Bookmark' facility. This stores the feed as a bookmark which automatically updates to mirror the site content. Following this trend, Microsoft's new release of Internet Explorer - Internet Explorer 7 - discovers RSS feeds automatically on a page. IE7 will be included as standard in the new Windows Vista operating system. The overall result is that, sooner or later, we will all have an RSS reader as an integral part of our daily internet surfing experience. 1. Choose your reader, download and install it on your PC. 3. Copy the RSS feed address. Most browsers will allow you to right-click on a link and select ‘Copy Shortcut'. If not, click on the link and then copy the URL from the address bar of the browser. 4. Paste the link into the ‘Add New Feed' (or similar) section of your RSS reader. 5. The feed should download headlines into your reader. Simple. 2. Find a feed by either using the reader's search facility or following steps 3 and 4 for the Desktop Reader (above) and pasting a feed address in. 4. The feed should download headlines into your reader. Simple. 2. Navigate to a site featuring an RSS feed. 4. Click on this and select the appropriate feed. 5. The feed should download headlines into your browser's feed area. Simple. By their very nature, regularly updated sites that advertise jobs are ideal platforms for RSS technology. The feeds should be categorised or customisable to your interests and always be free for you to access. Jobseeking is an ideal candidate for RSS technology. jobs.ac.uk is the UK's leading online recruitment website for positions in the science, research, academic and related communities. Everyday we add over 100 new adverts from over 3000 clients in education, the wider public sector and the commercial world. With our RSS feeds that are customised by job sector, job type and geographical location you can have this information delivered directly to your desktop as it is uploaded onto the jobs.ac.uk website. This means you don't have to keep repeating your searches and perhaps will help you gain a head start in the applications process! Blog - a contracted form of ‘web-log', a website where messages are posted (often by one person or a group) and where the reader can post comments. They can often take the form of an online diary. Directory - a categorised database of links or feeds. Feed - a list of content items, often in summarised form, that link back to longer stories on a source website. Reader - a piece of software used to view feeds - either online, installed on a computer or integrated in a web browser. Syndication - enabling portions of data from one source to be used or hosted in another place. XML - Extensible Mark-up Language - a programming language used to describe data and share it across systems, like the internet. RSS feeds are written in XML.